" St. Charles Streetcar- New Orleans, LA - 1984." 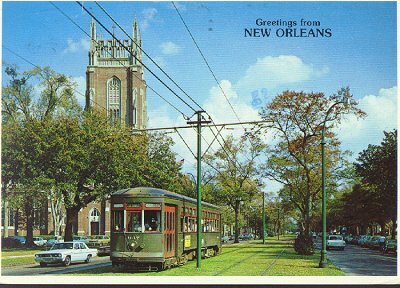 (1504) POSTCARD: St. Charles Streetcar- New Orleans, LA - 1984. -Condition: Very Good.- Posted. Colored photo of the streetcar with church in the background. Printed information about the streetcar on the back. Also a handwritten message stating surprise over the fact that people actually use the streetcar! Oversize measuring 6" by 4 1/4" Price: $4.50 + shipping.